It is 3:00am and we’re getting ready to begin our climb. 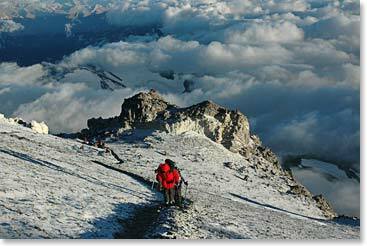 The entire 13-member Berg Adventures climbing team is setting off to attempt to reach the summit of Aconcagua. Simon will wait here at our high camp, supporting us with his kitchen and his wonderful food and we will be in radio contact with him throughout the day. Berg Adventures has the same situation at this camp every year, it always amazes me. The climbing season begins on Nov 15th and we show up here at this high camp more than 2 months later. By this time, the little A-frame shelters that are the hallmark of the Berlin Camp are always filled with snow, so when we arrive, we take it upon ourselves to shovel them out and use them as our cook shelter. Of course, 15 minutes after we do all the hard work of digging out the A-frames, the other expeditions arrive and wonder why WE get to use the shelter! Just a few moments ago, Hugo pointed out the Southern Cross in the absolutely clear Austral sky. These are strange stars for most of us from the Northern Hemisphere and the beauty of it astounds us, especially in such a special place as this, at the quiet hour of 4:00am. As I’ve mentioned before, this mountain is one of the high, demanding, dangerous mountains in the world, yet it does continue to attract unprepared people who may underestimate it. 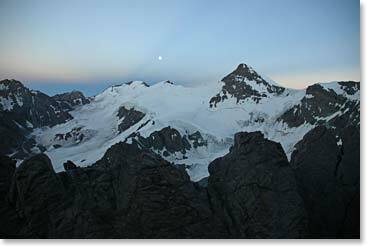 I definitely feel confident that we are not one of those groups as we set out to climb Aconcagua in this still, clear morning.